eMagazine Issue #168 (Dec. 2018) www.oldcardboard.com Note: For best display of this eNewsletter, we recommend that you click here. 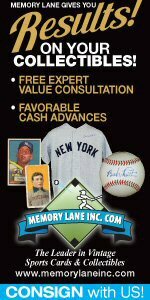 Welcome to Old Cardboard, the most complete reference resource for information about collecting vintage baseball cards and related memorabilia. More information about this eNewsletter and its companion website is found at the bottom of this page. The following is a summary of vintage card events coming up in the next 60-90 days. 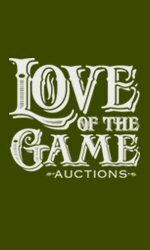 For the most current listings of additional vintage card shows and auctions, see the Key Events Calendar, accessible directly from the home page of the Old Cardboard website. Old Cardboard sponsors make up the Who's Who of the vintage card hobby. The support of the above sponsors enables us to continue to expand Old Cardboard's online info resources. We appreciate their support and hope that you do also. 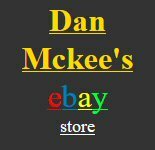 15 Phone/Internet Memory Lane Auction (see website for details). 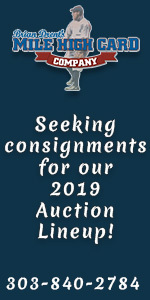 15 Phone/Internet Small Traditions Auctions (see website for details). 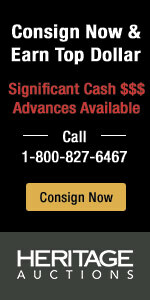 29 Phone/Internet Sterling Sports Auctions (see website for details). 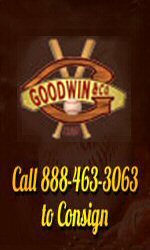 6 Phone/Internet Goodwin & Co. Auction (see website for details). 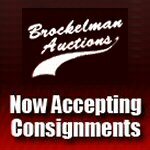 2 Internet Brockelman Auctions (see website for details). 23-24 Dallas, TX Heritage Platinum Night Auction (see website for details). 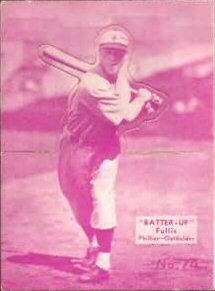 National Chicle's popular "Batter-Up" set was produced over a span of three years starting in 1934. Over that span, the company produced 192 numbered cards in the series. The cards are blank backed and have been assigned the number R318 in the American Card Catalog (ACC). All cards are borderless and display the player in a full-body action pose with a vertical format. They all have blank backs. 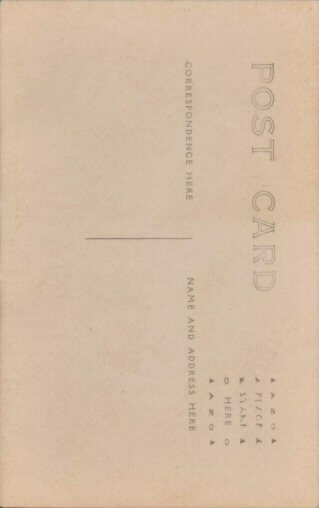 All cards were distributed during the Great Depression. They were wrapped individually in packs with gum, sometimes along with other incentives for purchase, mostly by young boys. The packs sold for one cent each. 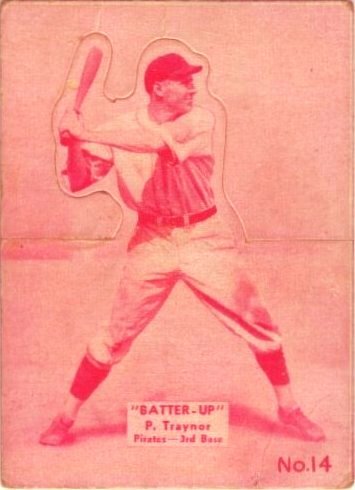 The Batter-Up issue is the first and one of a very few sets in which a silhouette of the player was die-cut into the top half of the card. This allowed collectors to create a free-standing figure by folding the card in half at the middle (see example of the Pie Traynor card at right). Many of the R318 cards found today were at one time purposely folded by their owner to form a free standing player. To facilitate folding, the surface of the card was machine scored by the manufacturer. As a result, in more extreme cases, cards are encountered without the top half (folded part), that became detached due to repeated folding. Based on card size and tint color, there are two distinct subsets in the R318 series. The first "Low Number" subset contains cards numbered 1 through 80. The Low Number cards measure 2-3/8 by 3-1/4 inches and are printed in one of six color tints. 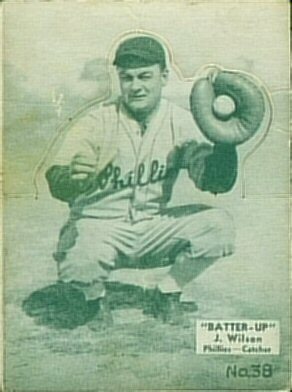 Each card has a white text block near the bottom that contains the "Batter-Up" set title along with the player's last name, team and playing position. The card numbers are also found in the lower portion of the image but not inside the text block. They appear in a hand-lettered style. The second "High Number" subset contains cards numbered 81 through 192. High Number cards are cut 1/4 inch shorter in height and are printed in one of four much more muted color tints. The labeling block is similar for the High Numbers except full player names are provided inside the panel along with the card number in typeset lettering. Cards in the High Number subset are somewhat more scarce than their Low Number counterparts. Note that, within the Low Number subset, cards #1-40 are found printed in all six colors while cards #41-80 are found printed in only four of these colors. Red or green tinted cards are not known for Cards numbered 41 through 80. All High Number cards were printed in all four colors. 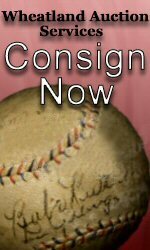 The set includes several dozen Hall of Fame players including set keys Jimmie Foxx, Dizzy Dean, Hank Greenberg, Rogers Hornsby and others. Noticeably absent from the issue, however, are two superstars of the period, Babe Ruth and Lou Gehrig. In total, 35 of the 80 players in the Low Number subset are also represented on the High Number cards. 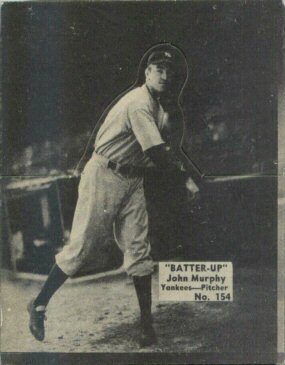 Each of the two Batter-Up sub-sets was produced at a different time, with the low-numbered cards distributed in 1934 followed in 1935 and 1936 by the High Number cards. The high-numbered cards are more difficult to find today and therefore command a premium about 50 percent higher than their low-numbered counterparts. Three different Batter-Up wrappers were used to package the cards (and the gum) over the three years the set was produced. Fortunately, the wrappers provide important clues about when the cards were distributed and the corresponding promotions used with each subset. The first wrapper (shown at left above) was used in 1934 to distribute gum and cards in the Low Number subset. 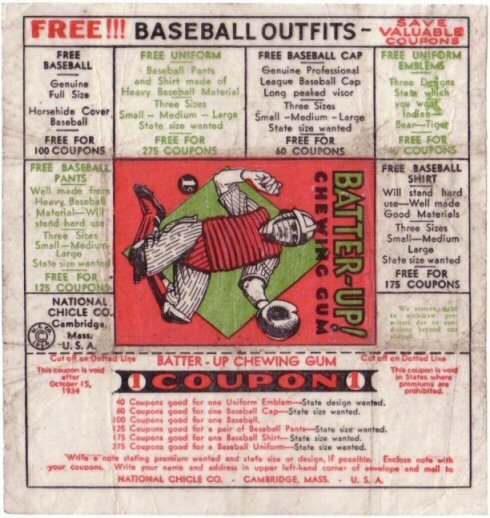 The wrapper describes several coupon redemption awards ranging from patches (40 coupons) to baseballs (100 coupons) to baseball shirts (175 coupons) to complete uniforms (275 coupons). One coupon was printed on each 1-cent wrapper. A note on the wrapper states that the coupon was void after October 15, 1934. The other two wrappers, noticeably different in appearance from the first, are printed with 1935 copyright labels. Rather than a coupon redemption program, however, each of the 1935 wrappers describes details of its own separate promotion. 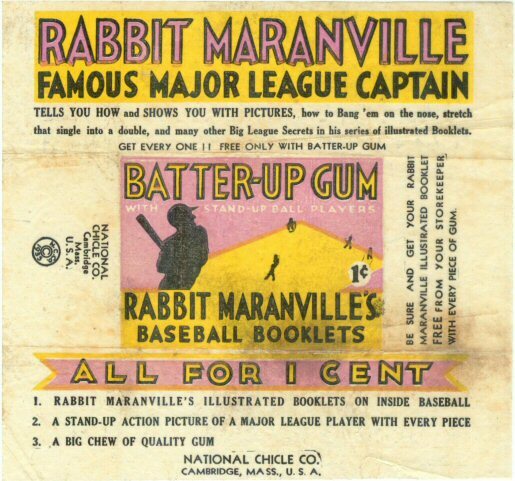 The middle wrapper describes details of the Rabbit Maranville "How to .." booklets promotion. The booklets were distributed by the "storekeeper with every piece of gum." The 20 booklets in the series are familiar to many vintage collectors today and are designated as Set R344 in the American Card Catalog. In addition to the "How To" booklets, National Chicle issued a Premium "Photo Art" series of selected players using poses from the Low Number subset. 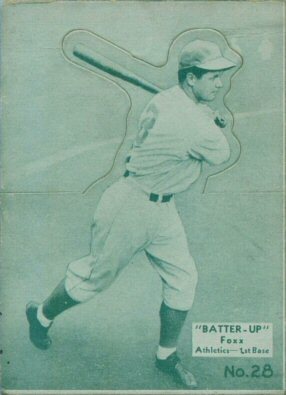 An example of one of these very rare premiums is shown here for Jimmy Foxx, along with his same pose from the Low Number Batter-Up regular issue. As also indicated in the images, the premiums are considerably larger (5 x 8 inches) than the regular issue cards (2-3/8 x 3-1/4 inches). Only six players have been confirmed for the Photo Art premium cards, and only one or two examples are known for each of the six players. 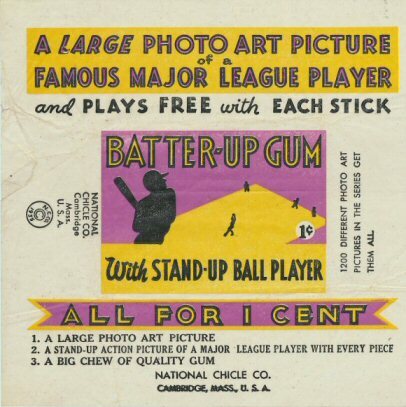 For a more detailed description of these Batter-Up Premiums, visit eNewsletter #73 on the Old Cardboard website. It is not clear today whether the High Number cards with the Maranville Booklet promotion or the Photo Art Premium promotion was first. Because the Photo Art premiums are so rare to current collectors, they may have been part of a final promotion that fizzled and was discontinued by National Chicle soon after it was launched. We welcome input from any of our readers that may be able to provide additional insight on which promotion came first. Note: A Set Profile for the R318 Batter-Up Regular Issue including a Checklist and Gallery of all 192 cards can also be viewed on the OC website. Postmarked in December 1896, the postcard illustrated below is no doubt among the earliest of all baseball-related postcards. It is also among the more interesting. 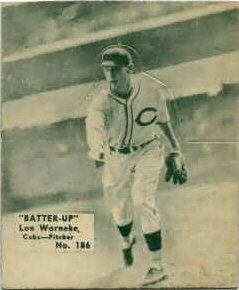 The card predates by nearly a decade the earliest baseball postcard sets known to vintage collectors today (including any of the postcard sets identified in the American Card Catalog). 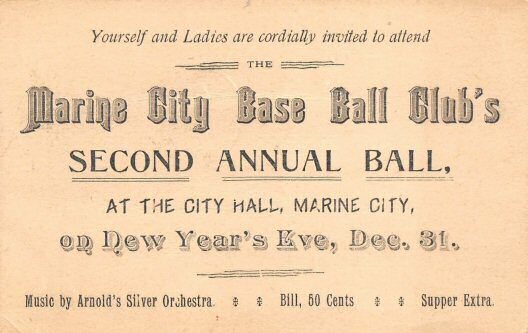 As seen on the front of the card, it was an invitation to the Second Annual Ball of the Marine City [Michigan] Base Ball Club held at the community's city hall on New Year's Eve, December 31, 1896. Admission to the dance was just 50 cents and included live entertainment by "Arnold's Silver Orchestra." Supper, however, was extra and apparently optional. 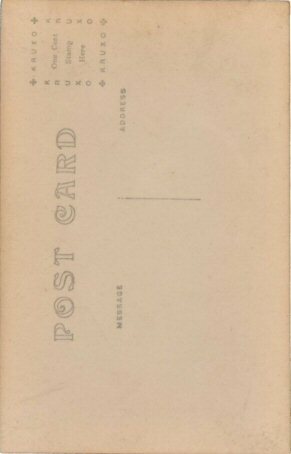 But while the front of this early postcard is interesting, it is the card back that is perhaps most historically noteworthy, for each of several different reasons. The first notable feature of the postcard back is that the stamp is printed directly on the card. At the time, the U.S. Post Office enjoyed a monopoly on postcard production and distribution and sold the cards directly to the public for one cent. The purchaser of a USPS-issued postcard did have the choice of buying cards with pre-printed postage featuring the portrait of one of two American leaders: Ulysses S. Grant or Thomas Jefferson (Jefferson is shown in this example). To be precise, a commercial printing company was allowed to compete and produce "Private Mailing Cards" (a.k.a. Souvenir Cards) to consumers. The consumer, however, was required by Congress to pay twice the going rate, or 2 cents, for the privilege of sending the "private" cards. 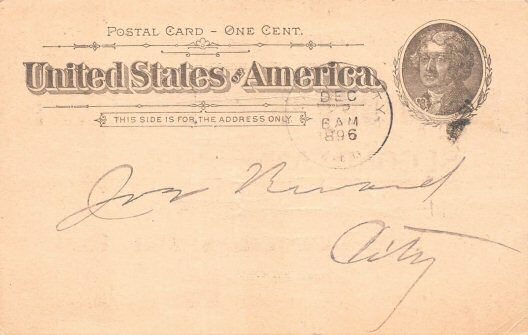 That restriction remained in effect until May 19,1898, when all postcards could be mailed at the rate of one cent. Secondly, the postcard back is printed without any space reserved for writing a message. A reminder is also provided on the card back stating that "this side is for the address only." 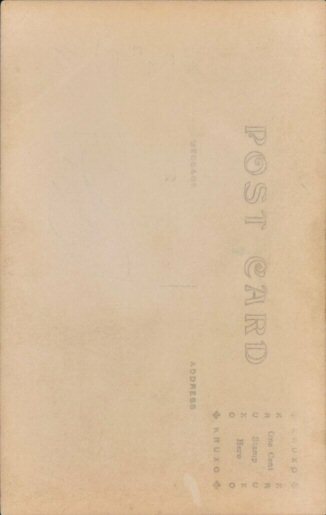 Known today as the "undivided back" era of postcards, the practice ended March 1, 1907, when the Post Office allowed private citizens to write on the address side of the card. Thus, the "divided back" cards remain the norm that we know today. 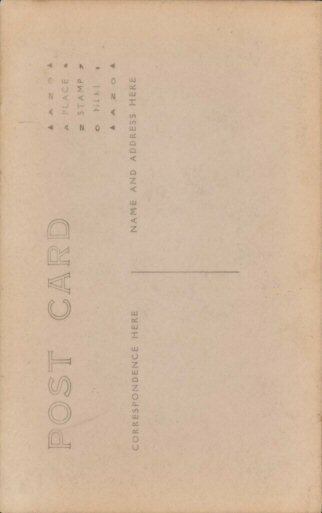 The third feature of the postcard back that seems to stand out is the address itself. This card is addressed simply to "Joe [not clearly readable last name], City." There is no street name, no street number and no zip code (a system introduced in 1963). Even if Joe was the star of the baseball team and well known throughout the city in 1896, we can only imagine how that might work in a typical U.S. city today! Seven cards have recently been added to hobby checklists for the century-old Bregstone Postcard Set. This brings the total set size, including pose variations, to 63 cards. 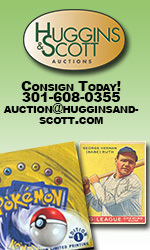 The newly added cards were part of a collection recently sold at a Robert Edward Auctions (REA) auction. The issue is among the most obscure of the early 20th-century baseball postcard sets. They were produced by H. H. Bregstone, a St. Louis photographer, and feature players from both of the St. Louis teams--the Browns and the Cardinals. The set carries the PC743 designation in the American Card Catalog. Based on player rosters and small variations found on the cards (details below), it appears that the cards were issued over a period of several years from 1908 through 1911. The high-resolution real-photo postcards display full length images in a vertical borderless format. All cards are sepia toned, although there are some variations in focus and intensity due to aging and perhaps differences in printing over the four year period they were produced. The player's name is displayed at the bottom along with his position, team and league affiliation in white lettering over a dark panel. 4) by H. H. Bregstone. St. Louis. It is these variations that help collectors identify the years that the cards were issued. Of the 63 cards in the Bregstone set, 22 depict players from the Browns while 41 (including pose variations) display members of the Cardinals. The postcards are not numbered. For checklist purposes, however, they are often numbered alphabetically within each of the two team subsets. 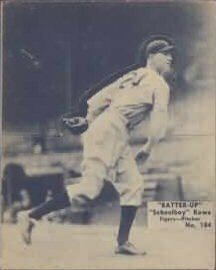 The first introduction of the Bregstone postcards to the vintage hobby was likely its listing in the ACC. At that time (1960), the set was listed as having 20 cards. A more detailed analysis of the set was published in an article by Steve Mitchell in the June 1974 issue of Sports Scoop based on cards then owned by Steve's fellow Washington state collector John Eichmann. A checklist was included in the article that identified cards for 23 players (3 Browns and 20 Cardinals). In the next issue of Sports Scoop (July 1974), pioneer collector "Buck" Barker expanded on Steve's article, including a list of the 21 cards (mostly Browns) in his collection. Because there were only four cards common to the only two known Bregstone collections at the time (those of Eichmann and Barker), the resulting set checklist was expanded to a total of 40 players. Then, in the Jan-Feb 1993 issue of The Old Judge Newsletter, OJ editor Lew Lipset provided an update to the hobby knowledge of the set, including an expanded checklist of 47 players. Since that time, the Bregstone postcard checklist has gradually grown. Based on this recent discovery, the list now includes 63 known cards, including players with multiple poses. Note: A PC743 Bregstone Set Profile is provided on the Old Cardboard website along with a newly added Set Checklist and Card Gallery. 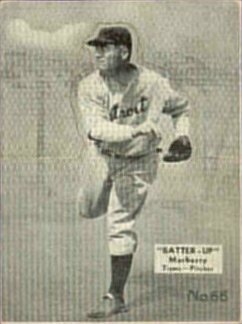 With the discovery in 2008 of a then nearly eighty-year-old previously unknown baseball card set, vintage collectors saw for the first time examples of six cards from the set. The issue was produced in 1920 by Peggy Popcorn of Winnipeg, Canada. As the result of the discovery of another card from the set earlier this month (December 2018), the Peggy Popcorn set checklist has now expanded to seven cards. 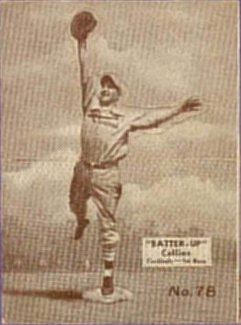 A card featuring HOFer Eddie Collins turned up in Toronto, Canada by a non-collector who had been "holding on to it for years" not knowing its significance to the vintage card collecting hobby. 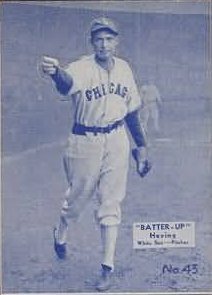 Collins is pictured in a White Sox uniform in the somewhat primitively produced black and white set. His name ("E. Collins") is the only text on the front of the card, printed in all capital block letters across the bottom border. The Peggy Popcorn cards are numbered on the back, where a redemption promotion states that there are twenty cards in the set. The Collins example is labeled as card number 9 in the series, bringing the total known players in the set to seven. The remaining thirteen cards remain unknown at this time. The redemption program states that one of several items can be obtained free of charge for the return of the complete set of twenty cards. The redemption items listed are: Fountain Pen, Eversharp Pencil, Ball, Bat or Cap. The sponsor is identified as "The Peggy Popcorn and Products, Ltd." located at 181 Market Street East, Winnipeg, Manitoba, Canada. 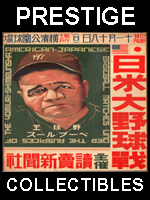 The seven known cards (which include a card of Babe Ruth) all feature Major League players and are of mixed design and size. Six of the seven cards (with card numbers under ten) measure 2-1/4 by 3-1/4 inches. Except for the Collins card shown here, the other five cards feature portrait (head only) images. The "oddball" card in the Peggy Popcorn sequence (card #16) features a three-quarter length pose of Dazzy Vance (actually Burleigh Grimes; click to enlarge image at left). The Vance card is also cut at a noticeably different size (about 2 by 4-1/2 inches) than all other known cards. Several questions and apparent errors continue to surround this obscure set. For example, most collectors agree that the "D. Vance" card is not Dazzy, but actually Burleigh Grimes. 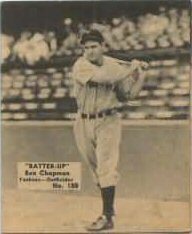 Some vintage collectors also suggest that the set was distributed in 1919 (not 1920) based primarily on the inclusion of a card for Chick Gandil. Gandil's last year in the Majors was 1919. 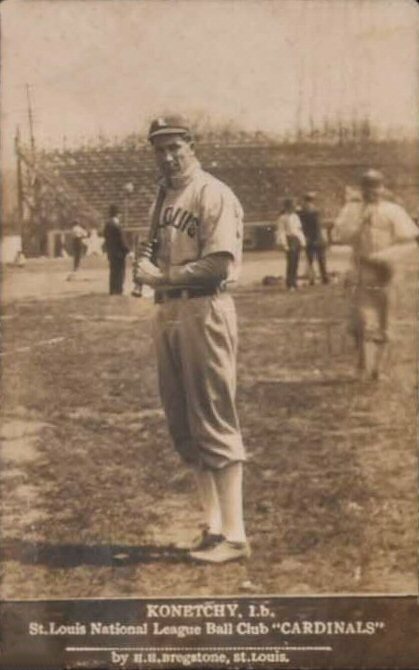 Further, as a key figure of the disgraced "Black Sox" scandal of late 1919, Gandil would not be a likely candidate to feature on a baseball card in 1920. 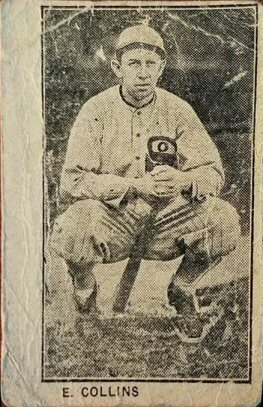 On the other hand, the Ruth card shows him in a Yankee's uniform, a team that he did not join until January of 1920. While these issues are further researched and discussed among collectors, we will continue to go with 1920 as the most likely year of issue for the Peggy Popcorn set. It is also possible, if not likely, that the Bregstone cards were produced and distributed over a multiyear period (perhaps 1919 and 1920). A Set Profile, Player Checklist and Gallery of all known cards in the Peggy Popcorn set can be viewed in the "Foreign > Canada" section of the Old Cardboard website. PC773 H. M. Taylor Pub. National Venues Projected Five Years. The sites for the National Sports Collectors Convention is now set through 2023. Based on ballots from exhibitors, the venues for the next five years are as follows: 2019 (Chicago), 2020 (Atlantic City), 2021 (Chicago), 2022 (Cleveland) and 2023 (Chicago). Based on numerous complaints from this year's exhibitors and attendees alike, the Cleveland facility staff has promised to beef up it's wifi service for future events. Fred Snodgrass Becomes a Texas Tommy. The checklist for the elusive 1914 E224 Texas Tommy Type 1 subset has grown by one player when a previously unlisted card surfaced this Fall. 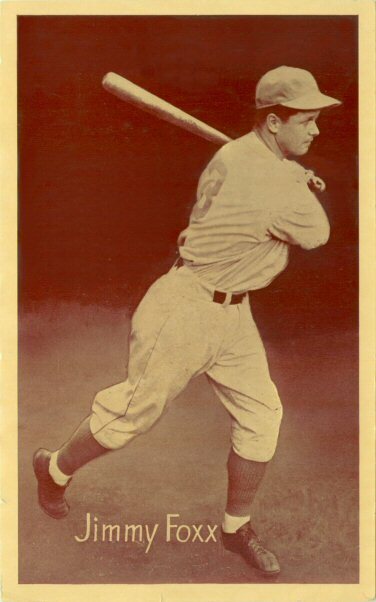 The card, featuring NY Giants center fielder and first baseman Fred Snodgrass, sold at a Heritage Auction for $7,800 including the buyer's premium. The Type 1 subset now contains cards for 52 players. The Texas Tommy Set Profile, Checklist and Gallery have been updated on the Old Cardboard website to reflect the new discovery. Interestingly, the Snodgrass card was also the most recent addition to the checklist for the somewhat smaller Texas Tommy Type 2 subset. Old Cardboard LLC. 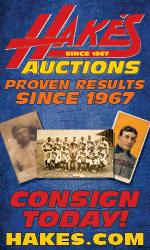 was established in December 2003 to help bring information on vintage baseball card collecting to the hobbyist. Produced by collectors for collectors, this comprehensive resource consists of three components: (1) Old Cardboard Magazine (currently on hold after printing 34 Issues), (2) a companion website at www.oldcardboard.com and (3) this eNewsletter. 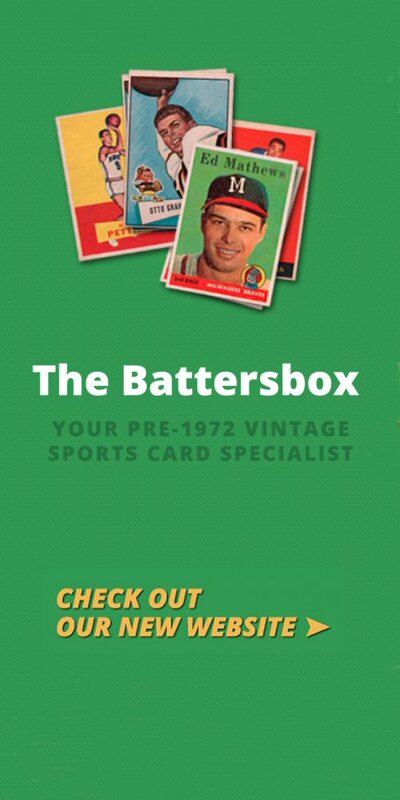 The Old Cardboard website contains nearly 1000 pages of descriptive reference information for baseball card sets produced fifty years ago or longer. Each of the set summaries has a direct set-specific link to auctions and a similar link to 's powerful search engine for further research. 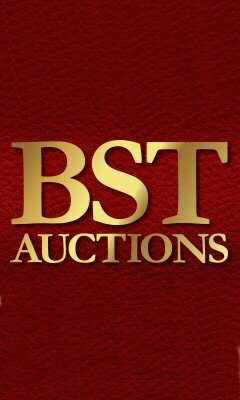 The website also includes a Show and Auction Calendar, an eBay Top 50 Vintage Sellers List, and much more. As a result, the Old Cardboard website makes a great "Alt-tab" companion for vintage card shoppers and researchers. 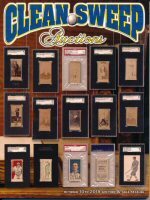 Old Cardboard eNews provides current hobby news, upcoming shows and auctions, and updates to the website. It is published quarterly around the middle of the last month of each quarter. For a FREE subscription to the eNewsletter, please visit the website at www.oldcardboard.com. If you find this information resource helpful, please tell your friends. We need your support and your feedback. Thank you.